3 Use cPHP built-in function memory_get_usage () to return the PHP script is currently assigned to the amount of memory, in bytes (byte). In the WEB actual development, these functions are useful, we can use it to debug PHP code performance. memory_get_usage () function returns the memory usage, memory_get_peak_usage () function returns the memory usage peaks, getrusage () returns CUP usage. But one thing Please note that you need to run on Linux in these functions. Agriya’s Getlancer is the remarkable freelancer clone script which is competently offering all the beneficial and key features of many leading freelancing websites like freelancer.com, Elance, oDesk and guru. It assists the entrepreneurs to bring their excellent website like freelancer within a few days. This script also appends many fresh and significant features like simple bidding system, dispute management system, internal messaging system, project milestones, escrow system, admin dashboard and many other interesting features for the smooth functioning of your website working as freelancer management. 9 Page Jump may be due to the user to click a link, button trigger, also may be the system automatically generated. Page automatically jump is often used in WEB development, and according to the demand can be with a jump in different ways, such as the prompt operation information delay jump, this paper summarizes some common page Jump method in WEB development. 5 OpenSearchServer is a stable, high performance search engine and a high rate of full text search algorithm. Supports a variety of document formats such as: XML, HTML/XHTML, PDF, Word, PowerPoint, RTF, OpenOffice, plain, text, MP3/4, Ogg, FLAC etc.. Its Web interface using Zkoss framework for the development, provides a simple way to manage OSS. Through the PHP client or API (XML over HTTP) to realize the rapid integration with third party. OpenSearchServer crawler can quickly grasp the website, database, file system to build your index. 5 Search engine is a very cool stuff, recently looked at Lucene, feeling pretty good, in fact, PHP can also make a search engine, the following is the popular open source php search engine. RiSearch PHP is a high performance, powerful search engine, especially suitable for small and medium-sized site. RiSearch PHP is very fast, it can search 5000-10000 pages in less than 1 seconds. RiSearch is a search engine index, which means it first so your site index and establish a number according to the keyword database to store all your website pages for quick search of the. 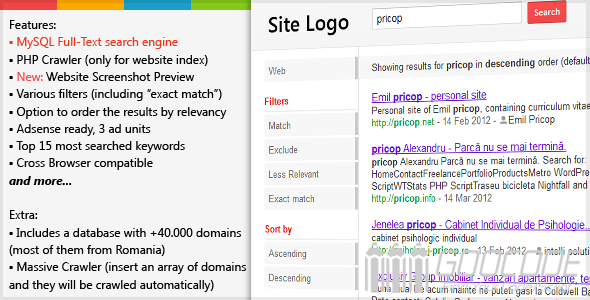 Risearch is a full-text search engine script, it put all the words are indexed in a single document in addition to define the key words of the configuration files excluded. RiSearch using classic reverse indexing algorithm (with the same large search engine), which is why it will be faster than any other search engine. 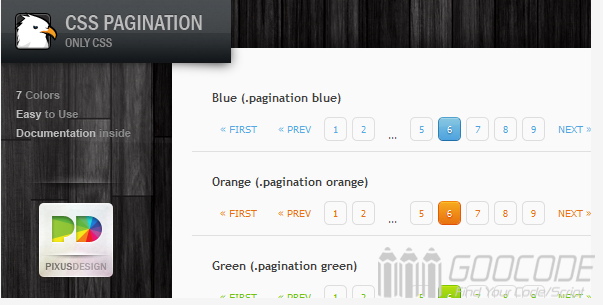 54 Twelve well designed pagination plugins for php/wordpress, such as CSS Pagination Pack, Simple Paginator,100 CSS3 Pagination Styles, Smart Pagination - Wordpress plugin, Pagimation - Colorful Pagination, may you like them. 11 With the advancement of technology, two-dimensional code applications more widely, before the site has article describes using jQuery plugin to generate two-dimensional code, and today I share with you how to use PHP to generate two-dimensional code, and how to generate two-dimensional code in the middle with LOGO image.